Speaking of Research has primarily concerned itself with educating the public about the role of animals in research, and improving how scientists communicate this subject. We also offer our thoughts on a range of issues including, animal research ethics, government policy, and the balance between animal welfare and scientific needs. Nonetheless, we have played an instrumental role in the formation of Pro-Test groups around the world. We have willingly offered our time, support and experience to assist the formation of both Pro-Test for Science (originally UCLA Pro-Test) and Pro-Test Italia. We remain in close contact with these organisations, with some of their members joining the Speaking of Research committee. 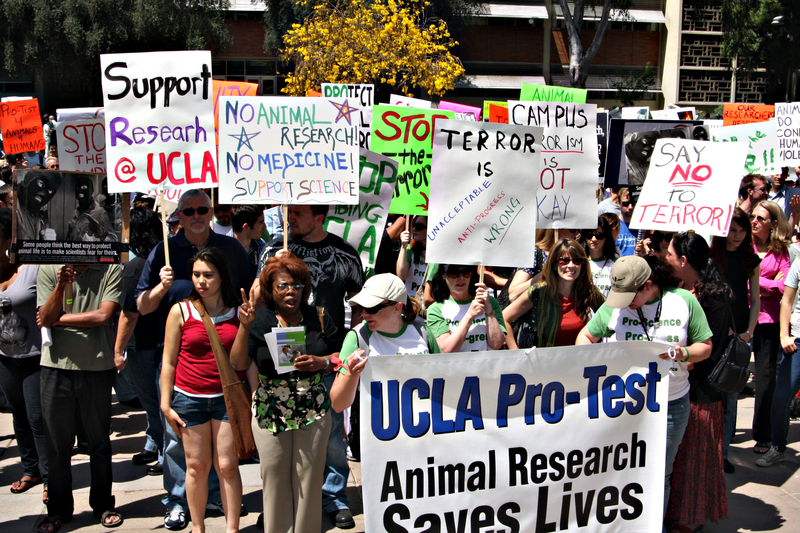 Pro-Test is a banner for all scientists who feel unable to speak up about research due to animal rights activism and animal rights extremism. It is a banner that researchers across the world can hold. Speaking of Research will offer our full support to any groups of scientists who need help making their voice heard and wish to spearhead a Pro-Test movement. Try and get a few colleagues together – those who are frustrated at not being able to speak out for animal research or against animal rights extremism. Consider appointing one or more of your group to work with the media – often the reason that only animal rights groups are heard in the news is because science organizations are unwilling to offer an opposing voice. Consider organizing a demonstration. Holding it on a weekend and on the same day as an animal rights demonstration can make it easier for people to attend and increase the urgency of your message. We realise there are many pressures on scientists’ time, and that it is easy to see this issue as someone else’s problem. However if your institution is put under pressure by activists then it will soon be everyone’s problem. Many researchers are scared that if they speak up, or are seen to stand with people who speak up, they will be targeted. This could not be further from the truth. While members of the Pro-Test movements may have been historically targeted, none have been targeted because of their involvement in a Pro-Test group – animal rights extremists prefer soft prey, someone who will not fight back.